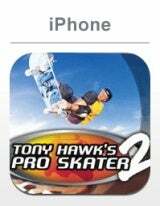 Here's the patched iOS release of Tony Hawk Pro Skater 2 featuring the original soundtrack and compatible up to iOS 10.3.3 ! - Jailbroken iPhone/iPod Touch or iPad (iOS 2.2.1 up to iOS 10.3.3 compatible) No support of 32bits apps on iOS 11+ ! - Play the game and enjoy the original soundtrack ! Note : Recent iTunes app for computers doesn't support the application management, you need an old one ! Last edited by Catarax on Wed Jul 18, 2018 5:27 am, edited 8 times in total. Thanks, wanted to play this version again! There is no android port. However you can get ePSXE for android and play the ps1 version which is the same thing. Crashes when showing the replay on Bullring for me. No options to disable replay? I got it, i just had to time it so i pressed the next heat button when the camera was lower than normal. Very odd. Very hard, did you managed to finish the competition?